International Olympic Committee (IOC) President Thomas Bach said he wanted closer co-operation from Japanese officials to ensure the Tokyo 2020 Olympic Games were the cleanest on record in terms of doping. “What is also important is that we want these Olympic Games to be absolutely clean Olympic Games,” Bach said on Saturday during a visit to Tokyo 2020 venues in Fukushima with Japanese Prime Minister Shinzo Abe. The IOC and the wider Olympic movement have been under pressure ever since Russia was banned from the 2018 Winter Olympics after the World Anti-Doping Agency (WADA) found evidence of huge, state-backed, systematic doping and cover-ups in Russian sport. 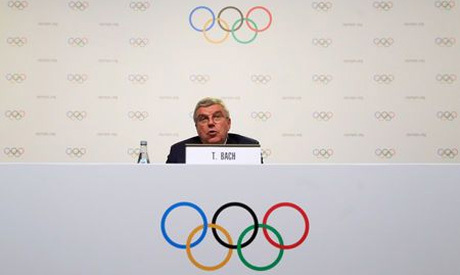 Bach, who was full of praise for preparations for the Olympics in 20 months' time, said he wanted the Games to be a great success in every respect, stressing the needs of athletes and keeping to budget among the priorities. He said he was confident of a balanced budget, which is good news for organizers who have been under pressure since cuts were made at the end of last year. Last December, Tokyo organizers unveiled a budget of $12.6 billion for the Games, a $300 million reduction from projections earlier in 2017. Bach made the trip to Fukushima to see the Azuma Baseball Stadium which will host the first events of the Tokyo Games on July 22, 2020. The area was ravaged by a 2011 earthquake and tsunami that killed some 18,000 people and caused meltdowns at the nuclear power plant in Fukushima. “We are very much impressed about the great progress, the reconstruction and also the mental recovery that the population has made in Fukushima,” Bach told Abe. “We are very happy that in this recovery, in this psychological recovery in particular, sport has played an important role. “We are convinced that the decision that we took some time ago to organize six baseball and softball games here in Fukushima was the right one,” he added. Bach is in Japan ahead of the IOC’s Executive Board meeting in Tokyo next Friday and Saturday.